What Ghost? (Welcome to Hellesville) by Jennifer Redmile is a stunning young adult paranormal novel about a boy named Billy, and his ghost twin sister, Becky, who died at birth. Billy's parents are sending him to boarding school, and he's worried that people will think he's insane when they see him talking to 'no one.' But he never thought boarding school would be as complicated as it is. 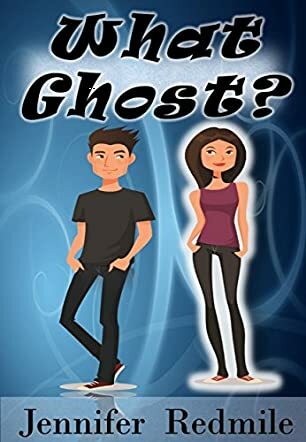 His sister Becky has fallen in love with another ghost, and meanwhile he has fallen in love with a girl named Kate. There is also a paranormal club with devices that can track and catch ghosts. And now there's a poltergeist in their dormitory. Will Billy survive boarding school? I really, really enjoyed reading What Ghost? (Welcome to Hellesville) by Jennifer Redmile. The story is very creative, and I really liked the idea of two ghosts falling in love. The book is very well written and descriptive. The book has many extremely exciting scenes as well as some funny scenes. The story is very suspenseful, and readers will find that they will not want to put the book down. The characters are very likeable because they're funny and smart. Readers will find themselves wanting to be just like the characters. I was hooked by the first page, and thoroughly enjoyed this read. The story is absolutely breathtaking. I love how the romance adds to the plot. The story is very fast paced, and a real page turner. I would definitely recommend this to everyone.